With headlines like “Dreaded ‘stomach flu’ wreaks havoc on families — and it’s only going to get worse”, the stomach flu is giving many families a rocky start to 2017. Stomach flu treatment focuses primarily on dealing with the symptoms while the virus runs its course, although a 2010 study suggests that probiotics taken early may shorten symptoms by about a day. First off, the “stomach flu” isn't really the “flu” at all. (It still makes you feel lousy.) It is caused by viruses, but not the influenza virus. Viral Gastroenteritis (stomach flu) is the second most common illness in the United States. It causes millions of cases of diarrhea each year. Heart Spring breaks down the symptoms and causes of the stomach flu. The main symptoms of Stomach Flu (Viral Gastroenteritis) are watery diarrhea and vomiting. Other symptoms are headache, fever, chills, and abdominal pain. Symptoms usually appear within 4 to 48 hours after exposure to the virus and last for 1 to 2 days, though symptoms can last as long as 10 days. The viruses that cause Stomach Flu (Viral Gastroenteritis) damage the cells in the lining of the small intestine. As a result, fluids leak from the cells into the intestine and produce watery diarrhea. Four types of viruses cause most Stomach Flu (Viral Gastroenteritis). Caliciviruses cause infection in people of all ages. This family of viruses is divided into 4 types, the noroviruses being the most common and most responsible for infecting people. The noroviruses are usually responsible for epidemics of Stomach Flu (Viral Gastroenteritis) and occur more frequently from October to April. Infected people experience vomiting and diarrhea, fatigue, headache, and sometimes muscle aches. The symptoms appear within 1 to 3 days of exposure. Heart Spring also states, “People who no longer have symptoms may still be contagious, since the virus can be found in their stool for up to 2 weeks after they recover from their illness. Also, people can become infected without having symptoms and they can still spread the infection.” I suspect I last became infected after spending the evening with family members who had “just gotten over the flu”, since my symptoms appeared roughly 48 hours after contact. Remember, if your symptoms persists more than 48 hours or are causing undo pain or other major problems, consult your doctor, as it may be a sign of a more serious illness. Skip anything with lots of sugar, caffeine or artificial anything (sports drinks, coffee, sodas, undiluted fruit juice, etc). Stay with soothing drinks like mint or chamomile tea, or restorative ones like coconut water or bone broth. Broth contains nutrients and minerals that aid healing. For my broth recipe, shown at the top of the post in a batch of chicken soup, visit How to Make Homemade Chicken Broth. Coconut water is high in electrolytes. If you want to have fruit juice for the little ones, please dilute it so that there's not as much sugar. Go for color free/additive free electrolyte drinks if you must. Small sips at regular intervals are easier on the abdomen than large quantities at once. Live culture foods help populate your digestive tract with healthy bacteria and other friendly beasties. This can help your body crowd out the troublemakers and speed your recovery. Yogurt, milk kefir, water kefir, kombucha, and lacto-fermented foods all contain bacteria that promotes a healthy immune system. You can, of course, purchase these items from the store or buy the little capsules, but it's really easy to make you own at home. This probiotic smoothie generally sits well in a sore tummy. Again, use small servings, especially with the kombucha, which can have a detox effect. No more than 2-4 ounces per day of kombucha tea. Yogurt and kefir are gentler and safer in larger amounts (up to eight ounces per day). Chia seeds are hydrophilic, which means they absorb water (up to 12 times their weight in water). You can use this property to your advantage by thoroughly hydrating the seeds before consuming them, and then using the seeds to carry water into you body. The gel-like coating that forms around the hydrated seeds soothes your digestive tract and slowly releases the water into your body as they pass through your system. In my case, I placed some yogurt and milk kefir into my Vitamix, poured in a tablespoon of chia, mixed slightly, and then let it sit and soak for 10 minutes before finishing the smoothie preparation. If you want something more basic, try chia fresca. Mix chia seeds and water. Let stand ten minutes. Add juice and sweetener and mix well. Take a soothing warm shower to relax sore muscles. If you can bear it, try a warm bath with a cup of Epsom salts. (At the risk of TMI, be careful if you are coping with diarrhea, as the muscle relaxation could result in “poop soup”.) The warm bath option is probably best for late in the illness. By that point, fatigue and muscle cramping have led to significant muscle soreness, but the worst of the vomiting and/or diarrhea has passed. Place a hot pack on the lower back or abdominal area to help ease cramping. Beyond these options, if your stomach can keep it down, eat lightly of nourishing real foods. The “stomach flu” is viral, so taking antibiotics will not help. Again, if you are experiencing severe pain or other complications, please consult your healthcare practitioner, as serious food borne illness may sometimes present in a manner that resembles stomach flu. 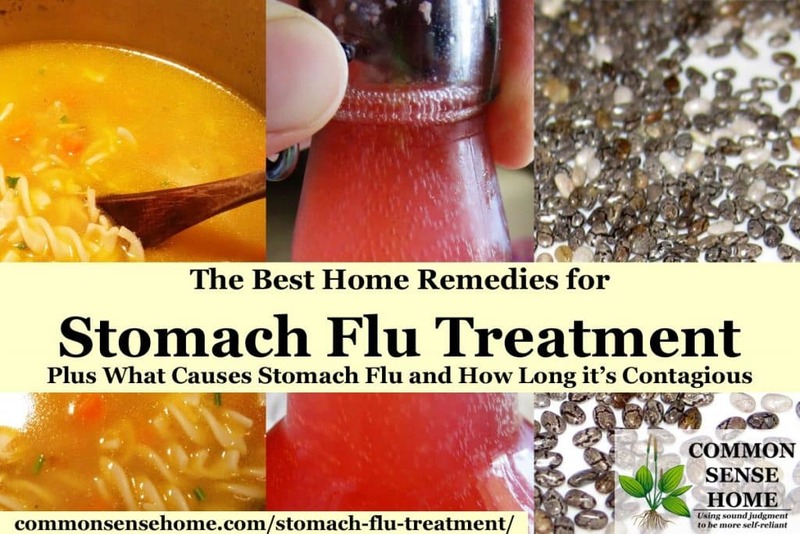 Typically, what I've seen recommended for stomach flu treatment are options like the BRAT diet (Bananas, Rice, Applesauce, Toast), and hydration with products like Gatorade. A more recent stomach virus treatment diet variation is the BRATY diet – Bananas, Rice, Applesauce, Toast, Yogurt. Over the past 10 years, however, a consensus has developed that this dietary restriction is a suboptimal choice because it is low in protein, fat, and energy content. This limited intake is not considered helpful to the body's healing or immune response to infection. See also – treatments for coughs, congestion, earaches and sore throat. Originally posted in 2012, updated in 2015, 2017. Thanks, I'm going to print this out and keep it handy! You're welcome. I hope this in one post you don't have to use. Sure, as long as you don’t overdo it, and if dizziness is a part of your symptoms, don’t tip over in the shower. Your suggestions are much better! I find staying hydrated and eating kefir really does help. I'm going to try the Chia Fresca next time: that one's new to me! 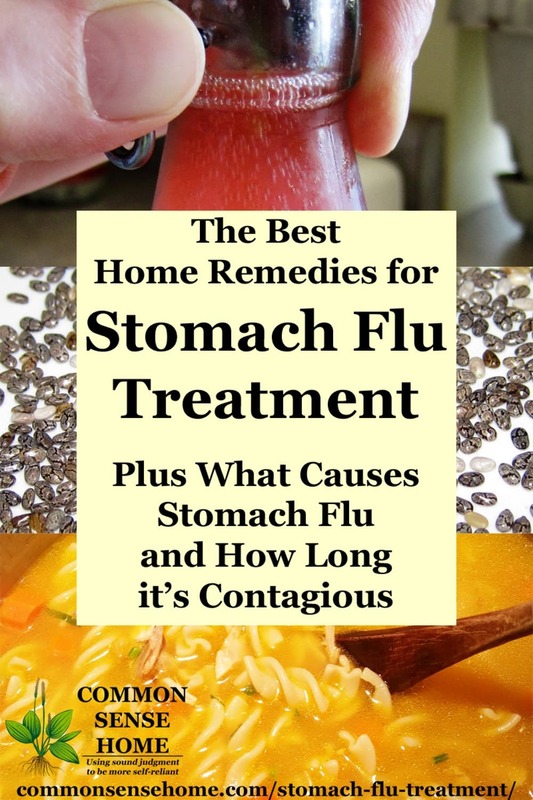 This post is full of great information and useful strategies to help with the stomach flu. Very informative post! Lots of wonderful info- Yes bone broth is like a miracle cure- my whole family requests homemade simple soups whenever they feel a touch of any illness coming on. We are also big fans of Epsom Salt, and always have a few cartons on hand. Great suggestions! I”m SO glad you posted this, because this is precisely the information I needed, today. Well, really, yesterday, too. But today is soon enough. Can you tell I’m sick with the flu? I just had a friend bring me chicken soup (I helped butcher those broilers myself, a month ago), and I have chia seeds in the pantry. And probiotics in the fridge. Plus I’m 17 weeks pregnant, and can’t AFFORD to be dehydrated! Thanks again! Oy! I hope it clears soon. That’ll really slow you down. Knock on wood, we haven’t been hit yet this season. The BRAT diet isn’t intended to heal but is food that is gentle for an upset GI system. I am coming off such a viral infection and am wondering how anyone finds energy to cook anything…including the tea recipes. There is no way I could have tolerated anything as strong tasting as even broth most days…I did manage chicken broth once but still had severe stomach cramps afterwards. The BRAT foods are the only thing I could tolerate. And since they are quick to no cooking…they didn’t wipe me out energy wise when getting them to eat. The idea of yogurt still turns my stomach even though I normally love it. WAAYYY too heavy. Ideally one has a caregiver while ill to help provide more nourishing options. Isn’t coconut water a laxative? Is that a good idea when you are suffering from stomach bug with diarrhea?? The content and composition of coconut water is similar to that of plasma found in blood. For this reason, this type of water is used in some tropical areas as a re-hydration fluid. It is commonly given to young babies and children with intestinal discomforts, and to those suffering from intense diarrhea, to maintain the balance of fluids in the body. When this milk is extracted without exposing it to any outside environmental factors, it can be administered directly into the blood stream. This was practiced during World War II and Vietnam by military doctors when they did not have access to intravenous plasma solutions for wounded soldiers. The consumption of too much of this type of water can cause a negative effect on the bowels of some individuals. This amount of water necessary to achieve this differs on a case by case basis. This occurrence is not common enough to validate the use of the water of the coconut as a laxative. Doctors frequently recommend that patients who do use coconut water do so based on their own bowel tolerance. When their stools become watery, users should decrease the amount of coconut water they are drinking in a day. I regularly drink coconut water and as my child’s caregiver I ended up sharing her illness. The coconut water was very beneficial for us both as well as mild soup/broth herbal teas with honey and we thankfully recovered rather quickly. I’ve heard that the stomach bugs are starting to make the rounds again. I hope you feel better soon! Tea and toast my mother also always swore by. Still works for me! I am so thankful for Google! Thanks to you Laurie for your post! I think I am just coming out of the stomach flu. Monday evening – Vomited for 11 hours every 1-1 1/2 hour ( always happens in the night 🙁 ) We called the nurse and she thought I was dehydrated, which I would agree, however , I didn’t think bad enough to go to ER. I have been trying to hydrate myself. The nurse recommended Gatorade, gingerale (defizzed), unfiltered honey and chicken broth. I have tired these things- it is now Thursday and I have a rumbling stomach and diarrhea. I am now trying the chia seed drink and I am continuing with my chicken broth today. It makes sense about the chia seeds! Sincere Thanks and I hope it works because my husband and I were going on a little get away this weekend…. If you have anymore tips for me I sure would appreciate it! Vomiting and diarrhea are a natural part of your body’s efforts to purge the problem. Whatever you have sounds quite virulent. I’m not too keen on the gatorade and ginger ale because of the high sugar content, which tends to feed the bad bugs. If you haven’t used a concentrated probiotic, I’d highly recommend one – Optimum Protiotics with Spore Forming Strains is the type I recommend (spores are a good thing), because the spores penetrate deeper into the intestinal tract to repopulate it with healthy bacteria. The more you can crowd out the bad bugs, the quicker your recovery should be. Most of us have a compromised microbiome in our guts due to stress, problems with the food supply, chemical exposure and other environmental issues. Laurie, I found your post as I was looking for info on what foods to eat after a bout with stomach flu. Yours came up with the best and most complete help! My 19 month old grandson is just recovering from stomach bug, and I came down with it as well. We share everything. I never had confidence in the BRAT diet, knowing that my grandmother and mother encouraged getting back to eating a strengthening diet. Homemade broths and homemade yogurts. Not so much breads and sugary foods. Your chicken soup recipe brought tears to my eyes. I make my own,too, and sent some Sunday for the baby. But I felt I was back in my Sitti’s (grandma) kitchen watching her put it all together, along with the chicken feet! All day as I came in and out I could smell the progress as the huge soup pot simmered on the back burner. I will enjoy keeping up with your post, Laurie, and passing on ideas to my daughters. Where has all this natural wisdom to living gone? We just have to look back a couple generations, sometimes! Thank you for sharing your story, Marlene. I think we’ve gotten away from the old ways because we’ve been pushed by media and schools to rely on pills and “modern science”, whereas back in the day, folks used tried and true methods to take care of problems. Modern science is finally getting around to finding out what grandmas around the world knew a long time ago, but there’s little money to be made in helping people to help themselves. If you enjoy reading about old school solutions, you may enjoy this post about my grandparents in the Great Depression – https://commonsensehome.com/great-depression-life/. Great common sense article, thanks a lot! Nice post..been looking for diet other than brat as I can’t eat them foods on a normal day let alone when sick. Omg I’m just barely getting over the stomach flu this past week as been miserable..fever, chills, nausea(still am a lil ugggh) thanks for the article I could use it. Thanks for the post. Yoghurt and other acid foods and beverages (like lime for example) can actually worsen the nausea and the vomiting. My daughter and grandson were visiting for Christmas, and as soon as they got back home home, (actually, my grandson was sick when they first got here, as his normally good mood was gone and he threw tantrums that were not like him at all) they both got horribly sick. As soon as my daughter texted me about this, I began taking vitamin C and zinc every hour on the hour. I did this for 4 days, and I never got sick, but everyone else they came in contact with did. I didn’t know that the reason why my son have stomach ache that come and go is because of stomach flu. Thanks for sharing Laurie. The problem with the BRAT diet is the banana and rice cancel each other out. You either use one or the other. In a homeopathic diet you use rice for diarrhea and banana’s for constipation. This is what we used to use for our infant son’s diet when he got sick as well with a stomach issue. Most dormant symptoms of the stomach ache are the shooting pain in the abdomen. I’m sick with the stomach flu and your post about the stomach flu was very helpful & useful. Thank you! You’re welcome. I hope you feel better soon. How about bone broth… something that will help heal your gut, I love the chia recommendation.